You’ve talked before about not wanting to waste time in your day. (Thanks for not counting this interview as such, by the way.) What’s a typical workday schedule for you? It depends on the time of year. Currently I’m in Milan filming the 2nd season of MasterChef Italia — the days are long. In New York, a typical workday starts early. I make breakfast for the kids, go for a run, head into the city and make the rounds at the restaurants. A lot of meetings take place at Eataly — you can usually find me at the Vecchi chocolate counter — and the day ends pretty late. Create the best meal composed entirely from the menus of your restaurants. Let’s start with Dave Pasternak’s crudo at Esca, move on to the cacio e peppe at Lupa, and then the squab at Babbo. To finish, pretty much anything that comes out of Brooks Headly’s pastry kitchen at Del Posto would top it off perfectly. In terms of writing, Jim Harrison; music, Ryan Adams; a global leader, I would want to be just like Winston Churchill. I really don’t measure my success against anyone else in my family. Collectively we are quite fortunate for the level of success we have attained—especially in the restaurant industry. What’s your everyday go-to wine; the one you always keep a couple of cases of on hand? The flagship wine of the Bastianich winery: Vespa Bianco. A blend of Chardonnay, Sauvignon Blanc, and touch of Picolit (Italian varietal native to Friuli). I could drink it every day — actually, I probably do drink a little every day. You lost an awful lot of weight – and a handful of health issues – by running. Tell us about the decision process that got you rolling on running. Did you try a bunch of other methods to get healthy first? My doctor sat me down about seven or eight years ago and told me I was on a one-way track to developing type-2 diabetes, amongst a few other nasty health issues. Being a restaurateur isn’t exactly conducive to dieting, so I took up running. It was difficult at first, but I stuck with it, and ended up really loving it. Kona. You did the Ironman at Kona. Tell us – most of whom don’t move that much in a year – about doing the world’s premier Ironman triathlon. It was quite a profound experience. Very spiritual. The endorphin rush that follows a race that extreme makes you high for the next week. While the mountain doesn’t get much higher than Kona, do you have another athletic challenge in mind? Everest would be pretty extreme. I’d actually like to compete at Kona again. I know I’ve got 11 hours in me. What do you hope your career highlight is going to be, once your career is complete? I’ve been fortunate enough to have some great highlights already — i.e., Babbo, Eataly — but I don’t seek success for its own sake. That’s never a good idea. I have a tough time, in the liquor store, finding wine that isn’t described in terms of fruit. I want words like “dark” and “earthy” and “truffles” and “tobacco” — not “juicy” and “blackberries” and “jammy.” Clearly this is the majority preference, so I ask you: What’s wrong with people’s taste buds? I think you should stop worrying about what is on the label and start to develop your own knowledge about different wines, and then you won’t have to rely on descriptions meant for mass appeal…If you decide you want to learn more about Italian wine, for example, pick a region and explore what is produced there. After a while, you’ll head into your liquor store and know what to expect when you pick up a bottle of Valpolicela or Dolcetto. Everyone’s palates are different, so those descriptions are not always helpful. From a dining perspective, what’s the primary thing that America could learn from Italy? Americans could stand to slow down a little, perhaps. Italians, no matter how busy, always seem to make time to come to the table together. Managing twenty-plus restaurants, managing three children, training for an Ironman triathlon. Which is hardest? Anyone who is a parent will tell you the kids are numero uno. But my kids are pretty good. The restaurants are certainly complex, and probably present the most difficulty. A moment of total self-indulgence: I got a nice 2008 Amarone as a birthday present. About how long until I can open it, and what should I do to show it to best advantage when I do? Most Amarones from decent producers can age at least ten years. I don’t know what you have, but it’s probably safe to say you’d benefit from hanging on to it for a few more years. I’m a native Chicagoan, so I have to ask: When are we getting an Eataly in Chicago, and have you found a place yet? We’d love to come to Chicago, and are actively scouting locations. What’s the best advice you’ve ever given to someone else? When asked for advice by someone looking to open their own restaurant, I told them they would be better off taking a couple hundred thousand dollars and burning it in the street. It’s a tough business to make money in. When it comes to tasting food on MasterChef, you have a magnificent poker face. Without naming names, what’s the closest you’ve come to losing it? The witch from this year’s audition rounds was pretty interesting. “Last meal” always sounds so bleak, but it’s the spirit of the question: What’s on the table for your one perfect dinner? I’d go with comfort for my last meal. One of my favorite dishes is something my mom has been making for me since I was a kid. It’s my own smorgasbord on a plate: raddichio, fried calamari, prosciutto di parma, kidney beans, red onion, and a boiled egg. What’s the best restaurant city in the world right now? I am not sure of the best, but Chicago seems to be doing a lot of great things these days. Hong Kong is also great. Books, wine, restaurants, TV. What’s the next world you’re taking on? My hands are pretty full at the moment. And finally: You’re a singer-songwriter, too. Hit us with a stanza or two of your own lyrics. Joe Bastianich is a restaurateur, winemaker, bestselling author, and television personality. 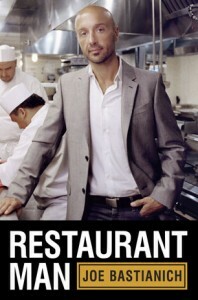 His new memoir, Restaurant Man, is available now wherever books are sold. Catch Joe in action on “MasterChef” Monday and Tuesday nights at 9 pm ET/PT on FOX. Top photo by Cass Bird.